In summer, many shrubs bear fruit that birds find irresistible. Elderberries, serviceberries, blackberries, dogwood berries, mulberries, and currants attract many species of birds, including waxwings, tanagers, robins, warblers and this Rose-breasted Grosbeak. Plants offer this bounty in exchange for birds’ help in distributing their seeds. And in dispersing pollen, birds, bats and insects also help to guarantee a new crop of berries! 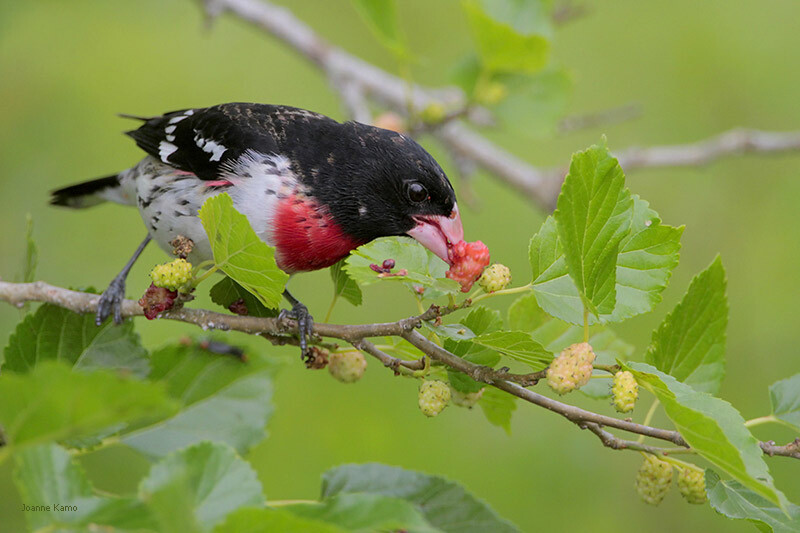 By mid-summer, many shrubs that in May shone boldly with flowers are now bearing fruit – fruit that birds find irresistible. Elderberries, serviceberries, blackberries, dogwood berries, mulberries, currants, and dozens of others. Waxwings, tanagers, robins, grosbeaks – even tiny warblers – feast on nature’s bounty. We might think that plants are being generous by offering such a rich supply of nutritious fruits. In truth, something other than largesse is at work here. Plants evolved fruits as a kind of bribe, a way of enticing mobile creatures like birds to ingest their seeds. Birds then excrete those seeds hours later, as they move widely about the landscape. Plants themselves take no metabolic benefit from the sweet pulp of their fruits. Instead, they offer this bounty in exchange for birds’ help in distributing their seedlings in new locations. Flowering plants also, rely on winged animals for pollination. Today’s show is brought to you by the Bobolink Foundation. For BirdNote, I’m Mary McCann. Bird sounds provided by The Macaulay Library of Natural Sounds at the Cornell Lab of Ornithology, Ithaca, New York. Song of Rose-breasted Grosbeak  recorded by W.L. Hershberger; wing beat and call of Ruby-throated Hummingbird  by R.S. Little.